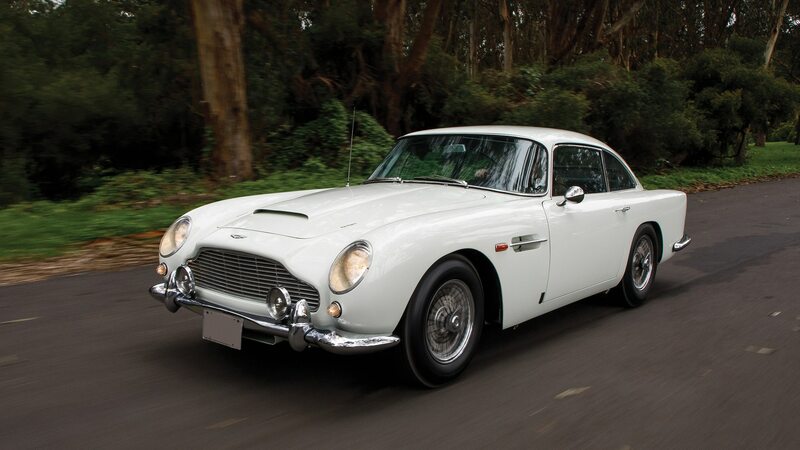 So says RM Sotheby's, who will sell the car at its new Aston-only Monterey auction in August. If you can’t get enough auction action during Monterey Car Week, you’re in luck. RM Sotheby’s is adding a third night to its 2019 Monterey schedule to focus exclusively on Aston Martins. The Aston-only auction night comes after RM Sotheby’s excellent results for two collector-grade Astons in the prior two years in Monterey, specifically the $21,455,000 sale of the 1963 Aston Martin DP215 prototype last year and the 1956 Aston Martin DBR1 that brought $22,550,000 the year before and set a new auction record for the marque at the time. Aston Martin has partnered with RM Sotheby’s for the exclusive sale and the auction house hopes to sell more than 30 of the British sports cars on the evening of Thursday, August 15 at the Monterey Conference Center. Just one of the cars to be sold has been announced at this point, that being a 1964 Aston Martin DB5 said to be one of the earliest examples of the classic model. The DB5 is perhaps best known as James Bond’s silver steed in several iterations of the 007 motion-picture franchise, and Aston Martin last year committed to building 25 brand-new ‘007’-spec DB5s for purchase, though none will be able to be driven legally on the road. This DB5 headed up for bids is a left-hand-drive model that the auction house claims is just the fifth of the series to be built. It was originally sold at British Motor Car Distributors in San Francisco, and went to its second owner in nearby Sausalito in 1981, whom it has remained with ever since. The car is said to have matching numbers and original colors, along with an overdrive transmission with a 3.77 final drive for relaxed long-distance cruising. The car’s long-term ownership and relative originality will likely help its chances of meeting or exceeding the $700,000 to $900,000 presale estimate. The RM Sotheby’s Aston Martin auction marks at least two Aston-only sales this year, as Bonhams’ long-running Aston Martin auction is scheduled for May in England. That must certainly make consignors think twice about which event to sell their classic Aston at, especially if it is a significantly rare and valuable model. At last year’s Bonhams Aston Martin auction, the company sold some 57-percent of its 35 cars offered for $5.7 million in total sales. So says RM Sotheby’s, who will sell the car at its new Aston-only Monterey auction in August. It’s a distillation of the Valkyrie that’s more usable and comfortable, Aston says. And we hear the engine redlines at 11,100 rpm.